Drink your way to health with teas, juices, smoothies and elixirs that offer easy ways to add vitamins, herbs and superfoods to your diet. 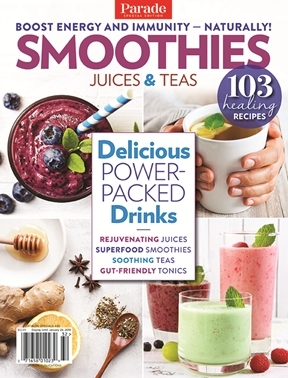 Smoothies, Juices & Teas has more than 100 easy-to-make drinks to nurture your body and soul. From soothing sips for sore throats and insomnia, to potent drinks that boost energy and the immune system, you’ll find many delicious ways to feel better. Includes a detailed ingredient glossary, as well as tips a guide to kitchen equipment to help you on your path to daily wellness.